Since my first involvement in spectrum policy at FCC in 1979 I was impressed that it was one topic of public policy at FCC that was not dominated by partisan consideration. Of course, every new chairman would say that all his policies were better than his predecessor, but in reality spectrum policies consistently evolved on a slow and steady pace independent of who controlled Congress or the White House. Two recent House hearing show the danger of this bipartisanship ending. The overall partisanship of the House Energy and Commerce Committee at the moment can be judged by the two slogans at left. These are 2 of 4 titles that appear in rotation on the committee website as of this writing. Who knew there was a “war on coal”? Under Gov. Romney didn’t the Commonwealth of Massachusetts also make Solyndra-like investments? Here is some of the coverage of a recent hearing of the Subcommittee on the GPS/LightSquared issue by our fellow bloggers at Ars Technica. Rep. Stearns: “When one operator veers into the adjacent lane, is it the responsibility of an operator to correct its course, or is it the role of the FCC to patrol the highway? Briefly." US Rep. Brian Bilbray (R-CA), an avid boater, said he understands the importance of GPS for safely finding one’s way home. But, "on the flip side," he said, more spectrum devoted to iPhones can improve safety too. "Just as much as GPS is essential there are thousands of people offshore every day that would have a huge safety factor if they could pull up an iPhone, and from 200 miles offshore be able to call for emergency services," he said. "This has a safety issue going both ways." Rep. Bilbray, conventional cell phones including iPhone, do not work and will never work from “200 miles offshore”. MSS systems like Iridium and the service offered by LightSquared’s presently operational MSS system (designed to share spectrum with their proposed but threatened terrestrial ATC system) do. It is ironic that what triggered the current imbroglio was LightSquared trying to offer cellphones that were terrestrial only as opposed to bulkier ones previously authorized by FCC that included both MSS and terrestrial(ATC) service. 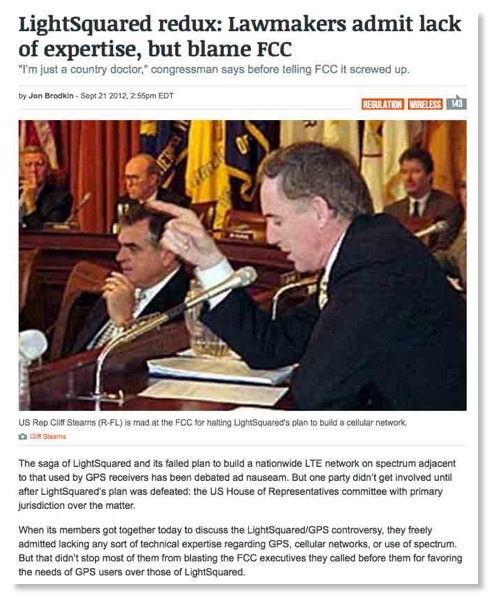 Months before the Republicans of the Energy & Commerce Committee came late to the GPS/LS issue, their fellow Republicans on the House Armed Services Committee criticized FCC for the exact opposite reason: why did they ever consider authorizing LightSquared as opposed to kowtowing to GPS interests and their self-centered view of spectrum policy. So House Republicans, which is it? 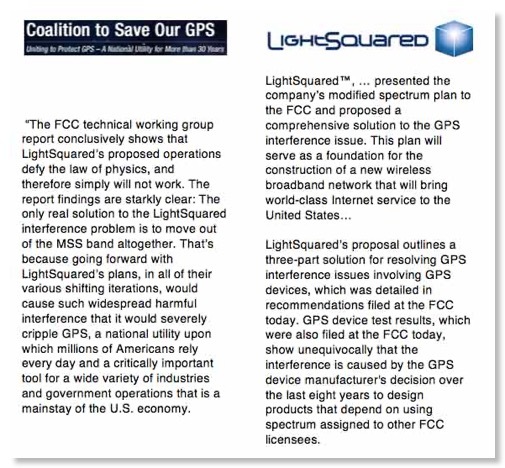 Is the current FCC wrong for considering LightSquared at all or it is wrong for not defending them again GPS interests? Perhaps both reasons are good enough to bash the present FCC and by implication the White House? Note that there were multiple FCC decisions under Chmns. Powell and Martin that supported ATC and LightSquared and its predecessors and that GPS interests participated in those decisions without major complaints at the time. On September 13th, the Committee’s Subcommittee on Communications and Technology dumped on NTIA at the behest of cellular interests. This time NTIA’s Karl Nebbia was beat up by the subcommittee members who were really angry over the PCAST report that Karl probably personal dislikes but had to defend as part of his job. While the free trade press did not cover this event, Keystone Public Affairs has posted this summary. In both September hearings the committee’s subcommittees were trying to make partisan hay out of US spectrum management issues. The reality is that there are major problems in our present spectrum policy decision making in the US as any longtime reader of this blog has read multiple times. The roots go back decades and are bipartisan in nature. What we really need to to keep spectrum policy bipartisan as it generally has been and work together to improve the process. GPS-enabled devices could be compromised if a plan to expand the United States’ broadband system goes forward, yet the company that proposes to build a broadband cell-phone communications network it calls LightSquared, 4G-LTE wireless broadband, is as yet completely undaunted by marine industry concern that the vital GPS system is under threat. As a long time sail boat owner (Jeanneau 32 Attalia based near Annapolis) and a radio spectrum policy wonk (Wi-Fi and Bluetooth began from rules I initiated at FCC in the early 1980s), I have been troubled by statement such as these made in Sail-World's article on the subject. However, these pale compared to statements made by Garmin at the beginning of the article or by BoatUS, the major boating membership association in the US to which I belong. First, what is the origin of this controversy? Cellphones and broadband are becoming key parts of our societies and economies. Today’s systems are rapidly running out of capacity. While the cellular industry exaggerates additional spectrum as the only possible cure for this capacity problem, it certainly is a key tool. FCC and its counterparts in other countries are all trying to find more radio spectrum for such services. About 20 years ago it appeared that 'mobile satellite service' or MSS, e.g. Inmarsat and Iridium, would be a key telecom service everywhere the world and that global spectrum had to be reserved for it. Advances in both terrestrial and satellite communications have proved this to be wrong in a key aspect: MSS spectrum is now very lightly used in populated areas and new technology allows the same spectrum to be used for MSS in rural areas and over oceans while used for cellular-like services in populated areas – effective 'recycling' otherwise unused spectrum in areas where it is sorely needed! One of the MSS bands involved is just below the GPS L1 band used by commercial GPS units. In the US, FCC has authorized use of this band for terrestrial cellular services (FCC jargon for this is Auxiliary Terrestrial Component or ATC) since 2003 and the company now called LightSquared has been authorized since 2004. Now there is some dispute about details of the early FCC decisions and how many base stations were allowed under them, but it is clear that base stations were allowed next to the GPS band since 2003 and that the civil GPS supplier community paid little attention to the fact that GPS would be having a new neighbor with much stronger signals in some places than the original MSS signals. Real receivers of all types do not have infinite ability to reject strong adjacent band signals. Such rejection requires careful design and the amount of rejection possible increases with time as filter technology improves. As long as the MSS band had no cellular base stations in it, little rejection was needed and GPS manufacturers did not have to incorporate the latest filter improvements which incurs both design and retooling costs. Thus it appears that the GPS industry has not pressed the filter manufacturers for the latest technology as the cellular systems in nearby bands have. As a result many GPS receivers have a lingering vulnerability to strong adjacent band signals that results from GPS manufacturers ignoring policy changes made in the US almost a decade ago! Spectrum chart - .. .
Rather than admit any responsibility for this and focus on a reasonable transition scheme, the GPS industry has chosen to make what a friend who is a GPS pioneer has described as a Jonestown-style 'suicide pact'. (The Garmin quote at the start of this article is an indication of this approach.) The industry has enlisted lawyers and PR firms and a broad variety of 'fellow travellers', such as BoatUS, to say the 'sky is falling'. It has even convinced the Air Force general who is responsible for the GPS satellites to testify that the LightSquared system would impact military GPS systems that were supposed to be jam resistant. Without getting too technical, if such a 100 watts transmitter 23 MHz away from the edge of the GPS band could impact military GPS receivers, imagine what a bad guy could do with a similar or stronger jammer transmitter inside the GPS band? And it is well known that simulated GPS signals are even more effective jammers, watt for watt, than noise or cellular-like signals. Military sources have told me that the general’s testimony on military equipment susceptibility actually dealt with obsolescent equipment from the early days of GPS that is still in inventory in small quantities and vulnerable to any undesired signal. But real boaters know something that lawyers and PR firms apparently don’t: boats float on water. The LightSquared/GPS controversy, especially after June 2011 move farther away from the GPS band, is an issue with GPS receivers that both have inadequate adjacent band rejection and are within a few hundred meters of a possible LightSquared base station – not a typical boating scenario but never mentioned in BoatUS material on the subject. In trying to use the public spectrum resource for the maximum overall public good national regulators like FCC regularly have to repurpose bands as technology and society’s needs change. Such repurposing sometimes impacts both incumbent users of the band, not so in this particular case, or users of neighboring bands. For example, several times in the last few decades TV spectrum in many countries has been repurposed for mobile communications. The usual solution is a transition scheme that balances the costs and benefits of the change and allows affected incumbents users time to adapt to the new change. The GPS industry and its fellow travelers appear to have no interest in such a transition that might make them admit to design errors in the past decade. Such a viewpoint could result in spectrum gridlock that prevents future repurposing of all bands. This issue is further complicated because the issues lies squarely on the fault line between the jurisdiction of FCC and a separate coequal agency, NTIA, that regulates federal government spectrum use. In a reasonable transition scheme the base stations could be designed to prevent high signals in all navigable waters during a period in which GPS receivers improve – but the GPS manufacturers and BoatUS don’t want to discuss transitions and the overall public interest in spectrum use. They have dug themselves into policy hole and demand only total victory! How did BoatUS reach this position and continue to maintain it after the LightSquared proposed to move further away from GPS? Multiple inquiries to BoatUS from this member have received no clear response other than vaguely siding with Coast Guards and industry. Did BoatUS use knowledgeable members in reaching and reviewing its decision? Like the boy who cried wolf, expressing unfounded fears to government regulators harms the credibility of the boating community in other regulatory decisions that could be more important to boaters. Sail World readers outside the US need not be concerned about this issue as it is purely a domestic US issue and individual countries have the discretion to make such decisions within their own territory under the terms of Article 4.4 of the ITU Radio Regulations. However, all GPS users might want to press GPS manufacturers about whether they are using interference rejection technology comparable to what cell phones in nearby bands use. "Despite the great news last week that the FCC has acknowledged interference issues with the LightSquared proposal, we're not ready to declare a victory," said BoatUS President Margaret Podlich. "Given this company's tenacity over the last year, we want to make sure that boaters' needs are remembered as the FCC makes their final decision." Sail-World article on BoatUS new request for comments. Just in time for the holiday season is an exchange between the two implacable forces in this major spectrum battle. The concept of using MSS spectrum for combined satellite and terrestrial purposes, and LightSquared’s authority to conduct such operations, have evolved with the active participation and support of the commercial GPS industry for almost a decade. Indeed, LightSquared has worked with the commercial GPS industry to ensure that GPS receivers would remain compatible with LightSquared’s forthcoming terrestrial broadband network in the L Band. 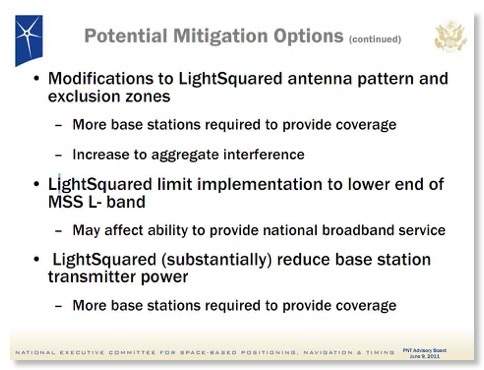 During this time, the GPS industry repeatedly supported the evolving technical parameters of LightSquared’s network—and, in particular, supported LightSquared in proceedings in which the Commission relaxed the numerical limits applicable to LightSquared’s terrestrial transmitters and significantly increased the power level at which LightSquared’s terrestrial base stations may transmit within its authorized MSS spectrum. (p.5). "Boat owners take the responsibility for the safety of our family members and friends very seriously. To compromise one of their most important, reliable, and critical pieces of safety equipment, which is the essence of the Light Squared signal interference issue with GPS, is not only foolish, but irresponsible. No margin of safety should be reduced simply because a private corporation sees a new business opportunity." While there are some complicated issues of aviation safety and impact of MSS band base stations on terrestrial GPS receivers within 100m of a base station, as the owner and user of boating GPS receivers I would have thought that this class of stations had the least issues. This makes me wonder if the hypothesis of a GPS industry insider I spoke to a while ago is correct. He wondered if the GPS industry players has all made a “suicide pact” and were prepared to “drink the Kool-Aid” if any subset of the industry was impacted in any way. "Transmitters Don't Use Up Spectrum, Receivers Do!" Each analog TV channel took one 6 MHz channel. The increment of 6 was to protect the mediocre TV receivers that were expected when UHF TV was authorized in 1952 “Sixth Report and Order”. They are a direct result of the channel separations mandated by “UHF taboos” in Table II of 73.698 which in turn resulted from assumptions of the ability of TV receivers to reject nearby signals and limits on how much they would unintentionally radiate internal signals that might interfere with neighbor’s reception. Again, these were all 1952 estimates - certainly based on earlier data since the FCC decision was made in 1952. A sad observation on the state of spectrum management at FCC in the past is that FCC never had the resources and courage to change this misuse of UHF spectrum as radio technology was revolutionized during the period 1952 - 1986. I cut off at 1986 because that was around the time that that HDTV came to center stage and DTV started looking feasible. Only the arrival of DTV finally removed the limitation on using only every 6th UHF channel. It is clear, to your blogger at least, that technology was available by the 1970s to have receivers with more robust interference immunity to allow more intense use of UHF TV even without DTV, yet the FCC did not have the political will to do so as it would have infuriated the TV interests that dominated FCC spectrum policy deliberations at that time. 12. Include receiver tolerances in regulation (either through (1) additional incentives, (2) mandates, or (3) some combination of incentives and mandates) to be used until can migrate to “interference temperature” regulatory scheme and to be used for the long term where use of interference temperature would be inapplicable; e.g., for systems in which licensees do not have control over receivers. 14. Issue Notice of Inquiry to characterize current and future receiver environments and to explore issues to consider, such as, performance parameters and protection for legacy receivers. Both the lengthly and inconclusive AWS-3 controversy and the current GPS/LightSquared controversy (not to mention the PCS H block issue) have at their root the issue of receiver performance expectation. Reasonable people could disagree about what are appropriate expectations for T-Mobile’s cell phone receivers - in the AWS-3 case - and GPS receivers - in the LightSquared case - with respect to adjacent band signal rejection. As in the case of harmful interference, NTIA and FCC need to develop a way to resolve receiver expectation issues in a timely way if they want to encourage technical innovation and the capital formation that is an integral part of it. Such resolutions need not make every party - or even any party - happy, but they are essential to maintain US leadership in both wireless technology and wireless services. The above SPTF recommendations would be a good place to start! 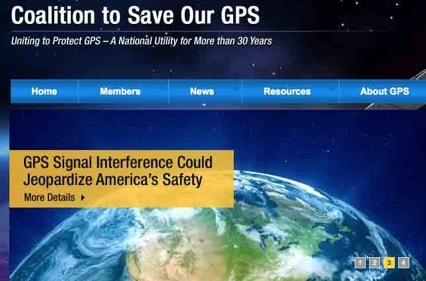 “Republican Reps. Steve Austria (Ohio) and Kevin Yoder (Kan.) introduced the amendment, which would prevent the FCC from spending any money to permit the service "until the Commission has resolved concerns of potential widespread harmful interference by such commercial terrestrial operations to commercially available Global Positioning System devices." Certainly the FCC has not proceeded brilliantly in this area, but despite the cries of the GPS community of bias, the real reason is just that the FCC (and NTIA for that matter) is presently poorly equipped to handle complex technical policy that lie outside of its past experience. Thus FCC did an outstanding job on the technical aspects of the DTV transition because it was a natural evolution of its strong traditional areas. FCC did a poor job on the Northpoint/MVDDS issue because of lack of related experience and resources until Congress (at DirecTV’s mischievous urging) forced it to hire an outside analysis. Rather than micromanage ongoing spectrum policy deliberations, perhaps the Congress should ask why FCC does no have the technical resources to handle such policy deliberations and ponder the implications of long drawn out spectrum policy fights on capital formation for innovative technology? Could the GPS its industry use its prodigious lobbying power for long term technical improvement at FCC or only in a selfserving way? Meanwhile, our friends over at FierceWireless have a good report on the latest spats between LightSquared and the GPS advocates. The report on LightSquared initial proposal has finally been released and a new battle of press releases has begun. The LightSquared release quoted at the top is here. The Coalition to Save Our GPS release quoted at the top is here. Indeed, today there is a TAC, but it continues to avoid current policy issues - unlike its counterparts at other regulatory agencies - and seems to be a major industry channel into the Commission - as if they need another one. This week Round 2 of the GPS/LightSquared struggle opened with a change in LightSquared initial operating plans after yet unpublished, but widely leaked, test results indicated some interference to the incumbent population of GPS receivers. After assessing this information, LightSquared immediately began developing an alternative deployment plan focused on the lower block of spectrum to launch its nationwide wireless broadband service. It also entered negotiations with Inmarsat, the satellite company that controls the alternative block of spectrum in the L Band, to accelerate the schedule for LightSquared to begin using the frequencies. Wireless Week reports that the actual spectrum involved in the new plan is 1526 MHz to 1536 MHz as shown above in red. Wireless Week add that “Even with the fixes, however, LightSquared’s network is still likely to affect precision GPS systems used by the military, aviation industry and agriculture.” Note that there are now 23 MHz between the upper end of the band LightSquared plans to use and the lower end of the GPS band. “LightSquared’s supposed solution is nothing but a ‘Hail Mary’ move. Confining its operation to the lower MSS band still interferes with many critical GPS receivers in addition to the precision receivers that even LightSquared concedes will be affected. The government results submitted to date already prove this, and the study group report will also confirm this. It is time for LightSquared to move out of the MSS band. Thus the FAA is being more open minded than the GPS manufacturers. It will be interesting when the detailed test results of the joint testing are released. There are hints of wide variability in GPS receiver susceptibility, probably due to odd filter choices used in the receivers. 1. An initial phase where LightSquared must design their system to protect all safety-related GPS uses, e.g. military uses and aviation-related uses, and most nonsafety-related uses in reasonable circumstances. 2. A middle phase in which FCC in cooperation with other agencies creates an environment to improve the GPS receiver population on a slow and deliberate basis. This could include improved mandatory standards for safety-related uses such as aviation uses even though FAA to date has kowtowed to AOPA and have never fully implemented analogous ICAO Annex X standards for ILS receiver immunity. For nonsafety related systems either a regulation, which FCC does not have legal authority for at present, or a labeling requirement indicating the interference susceptibility of the receivers in certain scenarios. 3. A final phase in which greater use of the MSS band is allowed subject to power flux density (pfd) limits based on separation from the GPS band. Note the inclusion of pfd limits here. FCC has historically limited transmitters based on effective radiated power (e.r.p.) or effective isotropically radiated power (e.i.r.p. ), measures of power leaving the antenna. This is a historic relic of when frequencies were very low, wavelengths were very long, e.g. 200m, and antennas had little gain. Interference is actually related to power at the receiver’s antenna which is more closely related to pfd. At the frequencies involved here clever antenna designs can lower pfd in undesired locations, as alluded to in the first point in Mr. Bunce’s slide shown above. This lower pfd will lower interference potential although the current population of GPS receivers may include some models that are exceptionally vulnerable to almost any power in the adjacent band. Deere claims that “Wideband filters are required for higher rate, precision codes”. Well a review of this diagram indicates the wideband filter is used primarily to allow a common front end for the GPS, GLONASS, and Inmarsat receiver in their system. 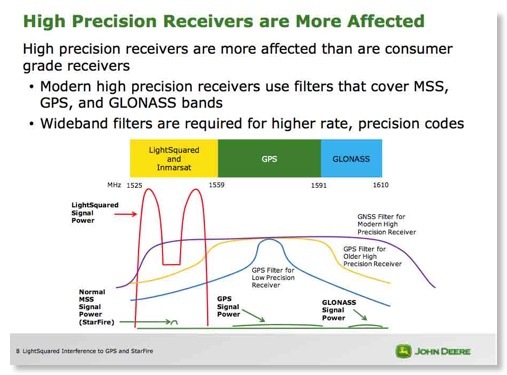 Since the GPS community, including Deere, has been on notice since 2003 that some terrestrial use was allowed in the MSS band, why would a manufacturer use such a filtering approach? Note that most of the MSS band has no GPS information, rather it contains narrowband Inmarsat signals with GPS augmentation information. A reliable source in the GPS community has told your blogger that the wideband filters used in precision (RTK - cm accuracy) GPS receivers that overlap the MSS band somewhat are there mainly to speed acquisition time and are not the determining factor in location accuracy. I hope the GPS community clarifies this issue. It appears unlikely that it will take anywhere near “$3 billion” to update Deere’s design mistake, which they should admit, rather than hiring lawyers to obfuscate the issue. On 6/23 there was a House subcommittee hearing on this topic. My hometown paper, The Washington Post, sent their transportation writer to cover it and came up with this headline: “Wireless expansion plan would eat GPS signals, critics say”. Opponents of the plan by Reston-based LightSquared described in stark terms the impact it would have on GPS, endangering rescues at sea, adding risk to planes landing in bad weather and garbling dashboard-unit reception. “LightSquared’s proposal is sort of like driving a lawn mower in a library,” Philip Straub, a vice president of GPS manufacturer Garmin. “LightSquared has no intention of operating a system in any way that will compromise government or commercial aviation operations,” LightSquared Vice President Jeffrey J. Carlisle said. “LightSquared’s proposed broadband terrestrial network will cause catastrophic and perhaps life-threatening harm to reliable GPS services,” Straub said. “The impact of the LightSquared upper-channel spectrum deployment is expected to be complete loss of GPS receiver function,” Margaret T. Jenny, president of the Radio Technical Commission for Aeronautics told the committee. It was unclear from the article whether the above sound bites applied to the original LigthtSquared band plan (in blue in the top diagram) or the band plan revised after the initial tests (in red). 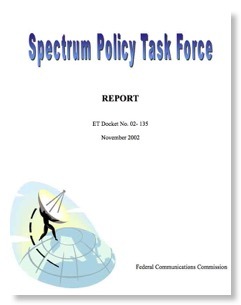 Those of us who are veterans of past spectrum squabbles such as NorthPoint, UWB, AWS-3 are used to these types of sound bites, but they highlight the need to improve the institutions of spectrum management in the US, perhaps along the lines outlined in a previous IEEE-USA letter to FCC. Effective and efficient spectrum use is key to GDP growth and underutilized spectrum is thus a drag on the economy. Increased spectrum use often results in some impact on incumbents and an objective and timely mechanism is needed to resolve these controversies. Otherwise, no one in their right mind will invest in innovative wireless technology R&D other than marginal improvements to existing technologies. "We have now tested one proposal here, and we found unfortunately that it did not work as originally hoped," said Roy Kienitz, the Department of Transportation's undersecretary for policy. "That does not mean the story is over. Our goal at DOT is to look for a win-win where we can have much better broadband service nationwide, but to do so without disrupting GPS and vital services it provides. The GPS/LightSquared issue gets more and more bizarre. Many of us used to think that law firms were taking too big a role in such technical policy issues, now it looks like PR firms are calling the shots! At left is an article from last weekend’s Washington Post, no doubt planted by the GPS community’s PR firm, Prism Public Affairs. The author normally writes about aviation and transportation issues, not FCC or spectrum issues. 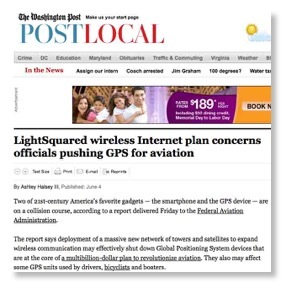 While the study concludes that LightSquared use of 1526.3 –1531.3 MHz “is compatible with aviation GPS operations for all the representative scenarios” - a point omitted in the PR-driven Post article, the study “ concludes that the current LightSquared terrestrial authorization would be incompatible with the current aviation use of GPS, however modifications could be made to allow the LightSquared system to co-exist with aviation use of GPS”. Rather than filing this report in the FCC docket, RTCA is selling it for $150! So if you want to know how they reached this conclusion, you have to “pay to play”. Since LightSquared has never publicly described their antenna pattern or antenna siting rules, one can only assume that RTCA, like Garmin, just assumed a 33 dBw isotropic radiator - that is, an antenna radiating about 1500W in all directions. Now neglecting the fact that it is impossible to build such an antenna in the real world, nobody uses anything near isotropic antennas in the mobile radio world and the 33 dBw was clearly intended as the maximum eirp in any direction, not the typical eirp. So RTCA could not wait until the completion of the joint receiver testing to blast its own conclusions based on incomplete information on LightSquared’s actual antennas. But as shown at right, LightSquared is showing that it can avoid the technical issues also and focus on PR. 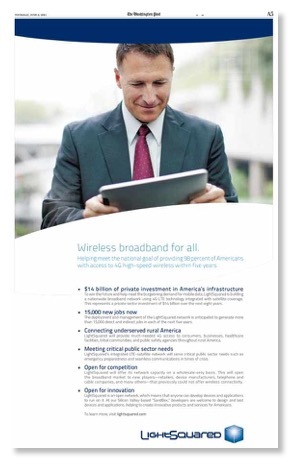 Several days last week they had full page ads in the Post extolling the benefits of their system: “Wireless broadband for all”, “15,000 new jobs”, “Connecting underserved rural America”, etc. Never mentioning that there was a serious technical spectrum controversy underway, indeed one of the most complex spectrum issues in that past decade. So like the GPS community, they are investing heavily in PR when perhaps they should be focusing more on the technical issues at hand. Both FCC and NTIA have technical advisory committees that could be used to review some of the technical issues involved. But both the FCC’s TAC and NTIA’s CSMAC seem to be mainly composed of vested interests in major telecom companies with a few public interest folks thrown in, not the distinguished members one sees on the Defense Science Board or the Air Force Scientific Advisory Board, not to mention NRC’s Advisory Committee on Reactor Safeguards. Furthermore, NTIA’s testing of GPS receivers certainly must have included military units whose performance is of necessity classified. CSMAC is not set up to deal with classified information although it certainly should not come as a surprise that some NTIA regulated systems have classified performance data. But more importantly, neither FCC nor NTIA have ever tried to ask their technical advisory committees for information on ongoing policy issues like other technical regulatory agencies do. These were issues raised in the IEEE-USA June 2008 letter to Chmn. Martin that was never answered. Maybe it is time for FCC and NTIA to review their resources for dealing with difficult spectrum problems such as this one. The spectrum struggle of LightSquared to obtain permission to use its spectrum for terrestrial broadband use in addition to the mobile satellite use it is already licensed for looks like it will be a classic one at FCC, bringing back elements of previous epic struggles like Northpoint/MVDDS, UWB, AWS-3/M2Z, and PCS H block. These all involved a proposed new spectrum use that threatened incumbent users with possible interference. To make matters worse, in 3 of the above cases the new entrant would also be competing with the incumbent, a combination sure to infuriate any incumbent with an FCBA directory at hand and the funds to wage a protracted legal battle. The fact that DirecTV was on “the auction block” during the Northpoint/MVDDS battle and T-Mobile was also during the AWS-3 battle meant that those two firms had extra incentive to assuage the fears of potential multibillion dollar buyers by waging a scorched earth policy before FCC. Now we see the GPS industry doing the same with respect to their neighbor LightSquared and NTIA and the military are joining in. The GPS industry is taking advantage of the “ex parte loophole” to lobby IRAC members and NTIA to press FCC off the public record. 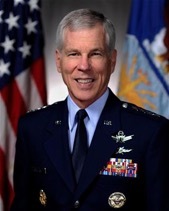 Speaking at the Air Force Association's Air Warfare Symposium in Orlando, Gen William Shelton says the 4G mobile broadband network in the works from LightSquared would spread 40,000 towers - and interference - across the US. "Within three to five miles on the ground and within 12 miles in the air, GPS is jammed by those towers," Shelton says. "If we allow that system to be fielded and it does indeed jam GPS, think about the impact. We're hopeful we can find a solution, but physics being physics we don't see a solution right now. Where did these numbers come from? A lot of people think he went “hook, line, and sinker” for data from a report from Garmin, not exactly a high end GPS manufacturer. “Physics being physics” - a great sound bite, but does it belong in the policy deliberations here? In this proceeding as well as the 4 mentioned above, the opponents of progress demonstrated that a poorly designed new system would cause interference to their system and then made the extrapolation that ANY such new system must cause interference no matter how it is designed! To make matters worse, Gen. Shelton and the GPS industry repeatedly use the term “jam”. Google now gets 175,000 hits on the terms “GPS”, “jam” and LightSquared”! Note that a recent joint USGIC/LightSquared joint filing uses the more objective and technically correct term “potential for overload interference/desensitization to GPS receivers, systems, and networks”. To help spread FUD, several companies and organization have formed a group, Coalition to Save Our GPS (CSOG). In addition to GPS companies Garmin and Trimble, the group includes: the Aeronautical Repair Stations Association, Air Transport Association, Aircraft Owners and Pilots Association (AOPA), American Association of State Highway and Transportation Officials, American Rental Association, Associated Equipment Distributors, Association of Equipment Manufacturers, Case New Holland, Caterpillar Inc., Edison Electric Institute, Esri, General Aviation Manufacturers Association, Deere & Company, National Association of Manufacturers, and OmniSTAR. Readers may recall that AOPA is the group that has successfully pressured FAA for 20 years not to adopt ICAO ILS receiver standards that prevent receiver-generated intermodulation because they would rather that the whole burden of preventing the problem be on the FM broadcast industry. These ILS receiver standards have been adopted in most other countries but would inconvenience AOPA members who might wish to use 20 year old ILS receivers and feel they have a constitutional right to use anything the FAA ever approved! As can be seen, most of the GPS energy is in its allocated spectrum above 1559 MHz but the blue colored L1 P(Y) has some noticeable power below 1559 MHz. While the L1 C/A code is what is received in consumer GPS receivers, the P(Y) signal was intended only for military use and is often encrypted. The latest GPS satellites use the L1M code which stays within the allocation. As an excellent e-book from Trimble points out, “Because this code (P(Y)) modulates both the L1 and L2 carriers, some advanced civilian receivers can play sophisticated games with the two frequencies to help eliminate errors caused by the atmosphere”. Thus the sophisticated real-time kinematic (RTK) receivers with centimeter accuracy use a piece of Government spectrum that was not planned for civilian use; with NTIA-authorized transmitters but receivers that never went through the NTIA spectrum planning process. In addition, L1 consumer grade receivers with marginal filters in their front ends could be subject to overload interference/desensitization from unexpectedly strong adjacent channel signals. The first problem is related to FCC and NTIA not paying enough attention to the fact that a large nongovernment community was using an NTIA authorized Government system in ways that were not planned. This latter problem is oddly similar to the PCS H block problem and the AWS-3/M2Z problem and deals with reasonable present and long term expectations for receiver filters. Normally in an exclusively government band like GPS’ this would have been decided by NTIA as part of its normal process, but the commercial products did not have to met the receiver specs filed at NTIA by the Air Force. An old saying in the spectrum management business is that “transmitters do not use spectrum, receivers do”. While FCC generally does not regulate receivers, NTIA does but commercial GPS receivers fell in the interagency gap. Resolution of interference has to be the obligation of LightSquared, not the extensive GPS user community of millions of citizens. LightSquared must bear the costs of preventing interference of any kind resulting from operations on LightSquared's frequencies. GPS users or providers should not have to bear any of the consequences of LightSquared's actions. So according to their first point, “public interest” should no be longer the criteria for spectrum policy decisions. 77 years after the passage of the Communications Act we should designate certain spectrum users, in this case not even licensees, with veto power over certain spectrum decisions. I bet the whole NAB membership will be next in line for such veto power or be insulted if they don’t get it first! In the second point it appears that as in the case of the aging ILS receivers that AOPA and FAA are protecting, any GPS receiver ever sold must be protected for the rest of its natural life. FCC is nearing the end of a 20 year transition of narrowbanding VHF and UHF land mobile spectrum. Would a 20 year transition for upgrading GPS receiver filters be slow enough be acceptable to CSOG? Since AOPA is involved, will they insist that spectrum efficiency wait until the last current model GPS dies a natural death as they have in the ILS case? Would groups like AOPA object to adjacent band signal rejection standards for new GPS units? Would that constitute the dread “bear(ing) any of the consequences of LightSquared decisions”? Are there any compensating public interest benefits of what LightSquared proposes in the eyes of CSOG? • LightSquared could carefully shape the beam and particularly the vertical pattern of their antennas to limit power flux density (pfd) on the ground and in the air. The alarmist Garmin report that Gen. Shelton appears to have based his statements on assumed 32 dBW EIRP for the LightSquared system and did not consider any beam shaping that would limit pfd on the ground or in the air. Thus it ignored all the lessons of the Northpoint/MVDDS controversy. •The GPS community could switch to higher performance filters in their new receiver front ends. Such a switch is not painless but filter technology, not unlike digital semiconductor technology improves with time and will continue to improve. •LightSquared could shaped their spectrum and stay away from the GPS lower edge in their initial implementation when they have fewer cell sites and hence need more power. The shape could change as the GPS receiver population improves with time and as increased cell site density decreases base station power requirements. Meanwhile read for yourself what is happening. For procedural reasons this is not a docketed proceeding, but is on the obscure International Bureau Electronic Filing System (MyIBFS). Here is a direct link. MyIBFS was clearly not intended for this type of “food fight” and may collapse under the weight of the consumer comments CSOG is soliciting- it is already getting difficult to use for this issue. Fortunately MyIBFS is so user unfriendly that individuals probably can’t file directly and CSOG is asking consumers to e-mail a general FCC address which probably will be swamped. Meanwhile, LightSquared and USGIC are meeting as directed by FCC to try to resolve their differences. FCC and the public get monthly views - on the chaotic MyIBFS site - of what is happening. It is sort of a negotiated rulemaking without the safeguards of the Negotiated Rulemaking Act. Negotiated rulemakings have never worked at FCC, but such 2 sided negotiations have had problems also. In the 1980s FCC told educational FM licensees to solve their power increase differences with adjacent band TV channel 6 licensees (another adjacent band power increase problem!) But the Commission had to fine tune the negotiated agreement, finding that agreements between the directly affected parties do not always reflect the overall public interest. On March 25 the Deputy Secretaries of DoD and DOT wrote to Chmn. Genachowski on the public record - since unlike NTIA they do not “share jurisdiction” with FCC. They complain that their agencies are not included “in the initial workplan or its key milestones”. They say “we are concerned with this lack of inclusiveness regarding input from federal stakeholders”. Wow! Given a choice between a seat - or 2 seats in this case - on IRAC or being invited to USGIC/LightSquared powwows I know which I would choose! IRAC members get drafts of FCC decisions that no other outsider sees and generally can make nonnegotiable demands on FCC as a price for coordination. Notwithstanding the fancy language about NTIA’s role, NTIA almost always acts as the IRAC’s messenger/law firm and types the IRAC demands on Commerce Department letterhead for transmission to FCC. On the other hand, the negotiated rulemaking approach above would avoid DoD and DOT being left out int he cold. But are DoD and DOT willing to stop using the “NTIA loophole” to funnel private firms issues to FCC through NTIA off the public record? Will DoD and DOT commit to full transparency in this proceeding except for valid national security issues? FCC has now place the comments in docket 11-109 so they are available by way of ECFS. Despite its many quirks, ECFS has much better search facilities than the obscure MyIBFS which clearly was not intended for such large proceedings. Clearly some “water has gone over the dam” since there January 22 deadline for this article, but readers will find much of this discussion relevant today.